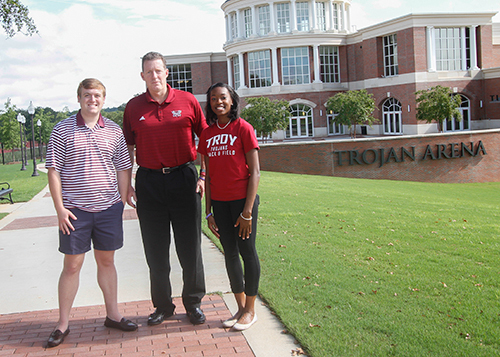 Troy University has big plans for game day thanks to the Student Government Association and the University Activities Council. Senior Tiffany Slater, the UAC president from Columbus, Ga. is excited to see how gameday operates with the newly planned events. “We were trying to think of ways to keep students in town and participate in gameday,” Slater said. Slater and SGA president senior Cody Farrill from Panama City, Fla. realized if their organizations came together, they could have more student involvement along with a bigger budget to work with. “Planning started earlier this summer,” Slater said. At each game, and after the pep rallies, bands will perform for the students and on the day of the game, SGA and UAC have planned for vendor entertainment to come including a rock wall, tattoo artist, caricature artist and a mechanical bull for students to enjoy. Farrill said not every student likes concerts, so the SGA and UAC wanted to have an activity for everyone to enjoy. “We’re hoping the excitement from the first concerts will make students want to come to the future home games,” Slater said. Slater wants to also inform students, especially freshmen taking orientation that all of the concerts will be considered passport events. At the first football game on Saturday, August 31, there will be a freshmen run to the field from the helmet right before the football team runs out. “We want these new students to get in the hype and feel what it’s like to experience gameday,” Farrill said. Slater wants to encourage students to come out to the concerts because the only way they will continue is if students participate in them. Farrill said he does not want the bands they’ve scheduled to take away from the Sound of the South, but he wants to give them time to be well rested for the game and the Trojan Walk. “We want it to be a matrix at Troy,” Farrill said. Farrill and Slater said they are thankful for the support they’ve received and that these new events couldn’t have been done without the help of Derrick Bruster and John Hartwell. “Get ready for this weekend, and remember that it’s great to be a Trojan,” Farrill said.